Preschool Playbook: Can You Put My Coat On? How many times have you heard that question? At nursery school if we had to put on every child's coat we would have to start 15 minutes before class ended. We have a little saying at our school that we start the beginning of January--"You flip, we zip." 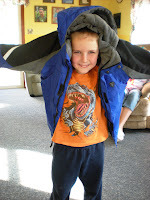 January is the month we formally start "teaching" the children how to put their coats on by themselves. Some of them were already able to do it by this time, some of them have learned over the last month and a half, and some are still working on it. This is one of those skills that we call independent skills. We try to teach the children in the three-old-class to be able to care for themselves and their belongings. 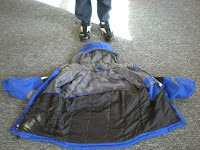 * The child lays the coat on the floor and stands at the hood or top part of the coat, facing the coat. *Next the child bends over and starts to put their hands and arms into the sleeves. *After the arms are pushed in they lift the coat and flip it over their head. They then come to us, we zip them up, and we're good to go. Would I do this at McDonald's, the movies, supermarket? I really don't think so, the floors probably aren't that clean. But, at school and home this is a skill that is really helpful. Don't worry, they won't put their coats on this way all their life either. 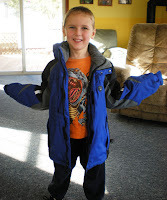 My kindergartner can now put his coat on the regular way. Good luck. I like it!! Flip and Zip. Although peanut is getting older, she's tiny and she struggles sometimes! I'll try it! Very important skill. I also send home a note and ask parents to please help by letting their child struggle a bit to get on their own coat and other clothes. Gotta have partners.